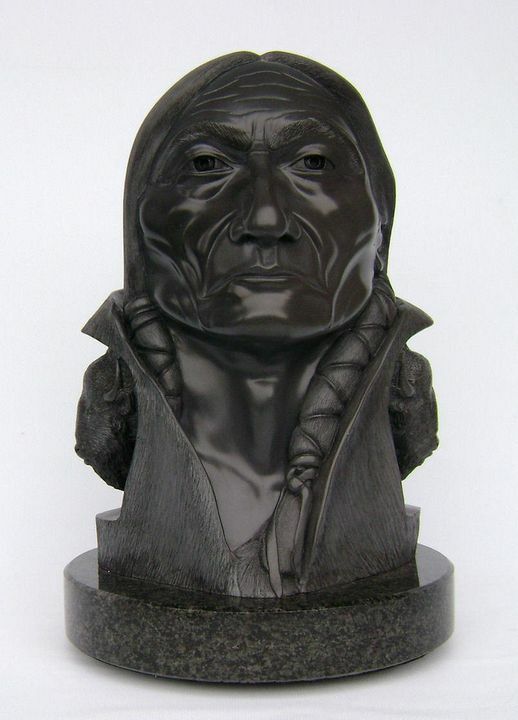 Bust of a Native Medicine Man. One of a Kind, Sculpted from beautiful African Black Perypholite(Wonderstone) on black granite base. "The buffalo came from the center of the earth through a hole the Creator opened to release them. Coyote, the Trickster, saw his chance to create some havoc. By drawing the Creator's attention away from the hole with a fake emergency he would forget to close it, allowing millions of buffalo to escape. To punish the people for not protecting their land from the destruction of the white intruder, the Creator sent the buffalo back down the hole to the center of the earth to where they came from."